Back in about 2003 and a few years following, a string of accidents leading to death or injury caused by cars with remote control engine starters incited panic in Japan. The starters, which allow you to turn on your car and allow the engine to warm up from a distance, had been improperly installed on manual transmission cars: Nothing prevented these cars from being started remotely while in gear, causing them to lurch forward suddenly then continue rolling along unmanned. Although legislation banning the devices on manual cars never appeared, manufacturers started labeling their products "for AT (automatic transmission) only" in Japan and mechanic shops started shying away from installing the items on manual cars--even cars in which a starter could be safely installed--for fear of future legal entanglement. One such shop that specializes in such installations (and, coincidentally, engine starter installations on cars with immobilizers as well) is AQUA in Matsumoto, Nagano. They offer a wide variety of starters suitable for most cars but specifically advertise to patrons whose cars were turned away for installation at other shops. Their prices aren't cheap, but the competition is few and far apart, and many of their patrons are used to sinking a lot of money into car modifications. For sporty cars, expect prices to start at 50,000 yen and up for the unit and installation, and for cars equipped with immobilizers, usually 60,000 yen and up. In manual cars, the ideal solution is to run a wire from the starter unit that checks electronically whether the car is in gear before attempting a start. In manual cars where this wiring is not possible, another safety mechanism is necessary. 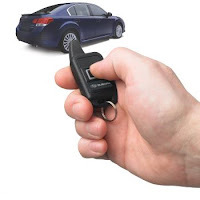 This could be a sensor on the emergency brake, a requirement for the car to be in neutral with doors closed and locked to be shut off (then disengagement of the remote start system if the car is entered without a remote start after that point), or even mirrors that send a reflection to a sensor when the gear shift is in the proper place. There are a lot of ingenious ways to "check" that a manual car is safe to remote start, and some of them are better than others. Remote starting a manual car also requires bypassing the "clutch start system," a safety measure on place in all manual cars in Japan (and elsewhere) since 1999 that requires the clutch to be disengaged (pedal pushed in) in order for the engine to start. Bypassing this vehicle safety system is a warranty issue and another reason dealers and many car shops won't perform this installation. The models of remote starter AQUA uses (as of this article) are the Yupiteru DCL81ES on Mazdas and Subarus, and the Vortex 3200-J or Viper 5501 on all other makes. Regarding the Yupiteru, a brand I'd never heard of, other models have been reviewed positively online, but I was unable to find reviews of this specific model. AQUA claims the Yupiteru setup is an elegant one, with no visible antennae and a wire running from the unit to make the necessary safety check electronically. Their website does not specify what safety mechanism is used with the Vortex or Viper. By the way, apparently starters are rated for certain temperatures; if you live in an area where winters often get below -10°C, you might find your unit doesn't respond on the coldest days. If this is an issue for you, be sure to check before installation. And, while we're already breaking manufacturer recommendations left and right with this topic, remember this one, too: Yupiteru advertises on their own page that their starters are for automatic cars only. So, your warranty on the unit itself is going to be void out of the box. So, that's a snapshot of the major issues regarding starters on manual cars in Japan, and one option for having such a thing installed. If you have any comments or experience with this, we welcome your contributions below! free car manuals pdf is a blessing for those who are having troubles in getting acquainted with his car's parts. It is totally free and anyone can download it from manuals co.